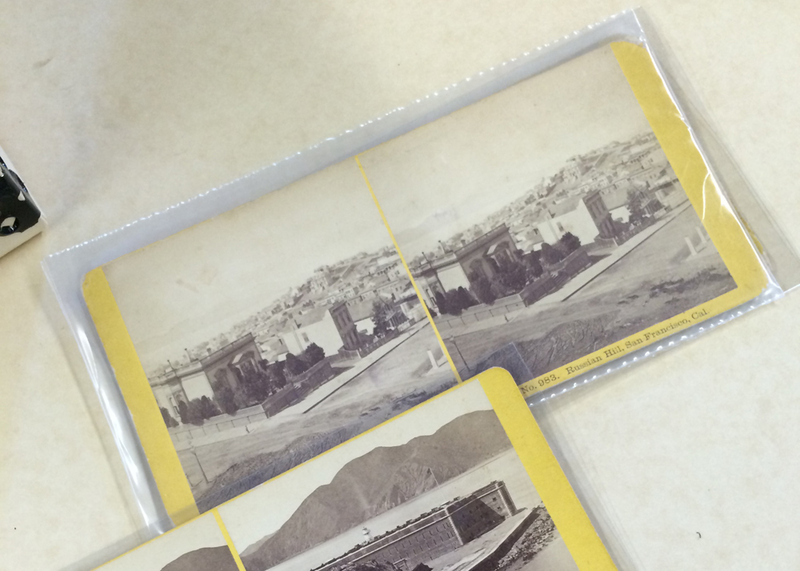 Digital images on OpenSFHistory are created from many types of original photographic material. Here we detail some of the formats. Glass plate negatives were in use by both amateur and professional photographers from the 1850s until the early 1920s. Examples in OpenSFHistory date from the 1880s, and sizes range from 8×10 inches to 2×3 inches. 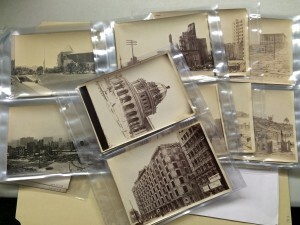 To date, we have cataloged over 800 glass plate negatives. 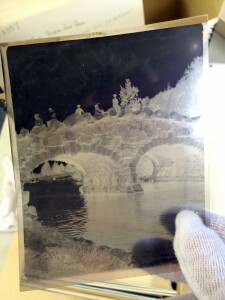 A glass plate negative viewed on a light table. Nitrate negatives are a plastic film in use from about 1895 until the 1940s when safety film largely replaced it. Most amateur film up though the end of the 1930s is nitrate film. Nitrate film is highly flammable, but will not combust spontaneously under normal environmental conditions. Nitrate film was still in production up until the 1950s and it can be difficult to identify. If we’re not sure about the chemical composition of a film negative, to be safe, we treat it as nitrate. After scanning, these items are vacuum-sealed and put into cold storage. To date, over 1,000 have been processed and put online. Beginning in the mid-1920s, nitrate film began being replaced with cellulose acetate film known as “safety film.” While more stable and less flammable than nitrate, safety film does deteriorate, and can become acidic, shrink, and degrade (a vinegar smell is a big tip-off). So far we have cataloged over 500 negatives. Lantern slides are mounted glass positives. They were mostly produced commercially for sale and were intended for projection on a screen, either in the home or in a theatre. 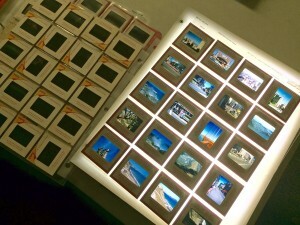 They are the precursors to 35mm transparency slides popular from the 1940s to the 1970s. 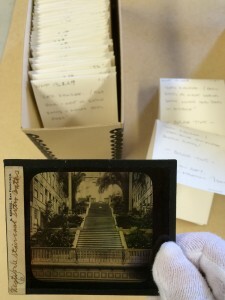 We currently count 272 lantern slides in the collection. Stereoviews, or stereopticon cards, are commercially-produced dual exposures mounted on cardboard for viewing with a special viewer to produce a three-dimensional effect. They are the precursors to Viewmaster reels of the 1950s and 60s. We have not digitized any stereoviews at this point. Primarily Kodachrome, 35mm positive transparencies in the collection date from the late 1940s though the 1980s. We currently have about 400 online. Copy negatives are pictures of pictures. 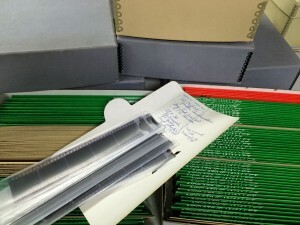 There are many, many copy negatives in the collection, so many that we have separated them into multiple catalog numbers. 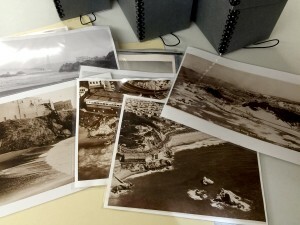 These images have many sources, from city agencies such as the Department of Public Works and San Francisco Water Department (PUC); institutions such as Society of California Pioneers and California Historical Society; and individual collectors and families who allowed their photos to be copied. The bulk of this type of negative are still in the process of being cataloged and digitized. Duplicate negatives are created in a darkroom by a process where positive film is exposed to a negative, resulting in another negative. Often this is accomplished as a contact exposure, where an exposed negative is laid directly onto film and exposed to light. Identifying duplicate negatives can be a challenge and some dupe negatives have been processed. Acquired through purchase and gifts, these items are mostly amateur photography and family photos, though a small amount of commercial photographs exist in the collection. 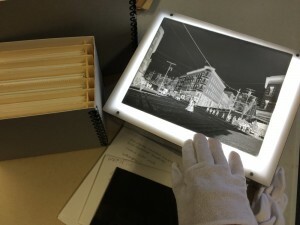 The private collector, whose collection is the cornerstone of OpenSFHistory, was an accomplished photographer and darkroom technician who made prints from many sources for reference, sharing, trading, and for sale. Often other collectors lent items for this purpose. The collector stored most negatives with one or more reference prints. Boxes of prints arranged by location were loaned out to other collectors or historians for scanning or duplication. Many of the prints in the collection are duplicated by original or copy negatives extant in the collection, but in some cases the negatives from which the print is derived was borrowed and returned. We avoid scanning contemporary prints unless we are sure that the negative doesn’t exist in the collection.